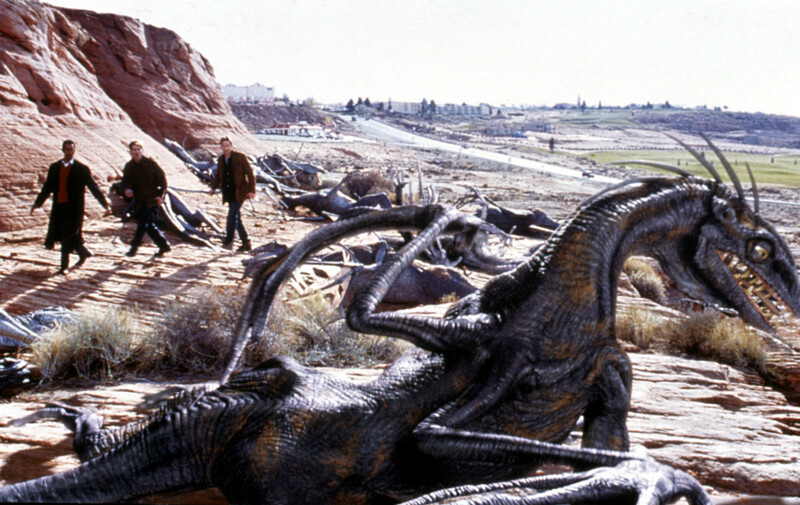 Reitman himself agreed that the look of the aliens should have a connection to Earthly animals. 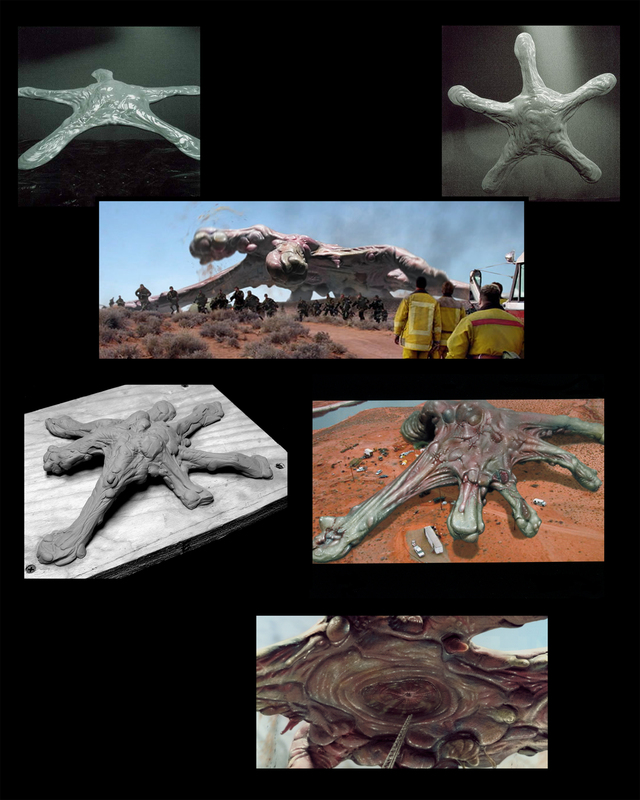 He related: “they were aliens, but there had to be some sense of reality about them — exaggerated forms, perhaps, but something with which we could still identify.” Reitman reviewed concept drawings and maquettes weekly, and however fantastic the creatures conceived in the design phase were, the team soon had to face the logistics of actually bringing them to the screen. The final roster amounted to around 18 creatures — some of which were alternate versions of the same basic template. Those translated approximately to 200 animation shots, a number that rivaled the Tippett Studio shot count in Starship Troopers — with the important difference of a much lesser time in which the crew could produce them. When the release date was moved further up of six weeks, Tippett and St. John decided that the workload of visual and physical effects would have to be shared between several companies. 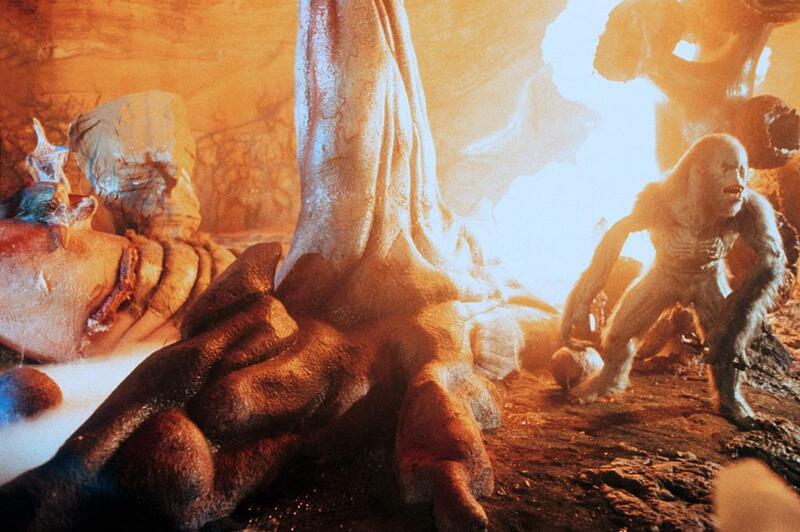 Tippett Studio retained the majority of the effects shots; Pacific Data Images produced the opening meteor sequences and some of the primitive lifeforms seen early in the film; Sony Pictures Imageworks was assigned certain insert digital shots; KNB Efx produced a number of physical effects, including dummies of the alien dragons; Amalgamated Dynamics was instead assigned the creation of the alien primates. 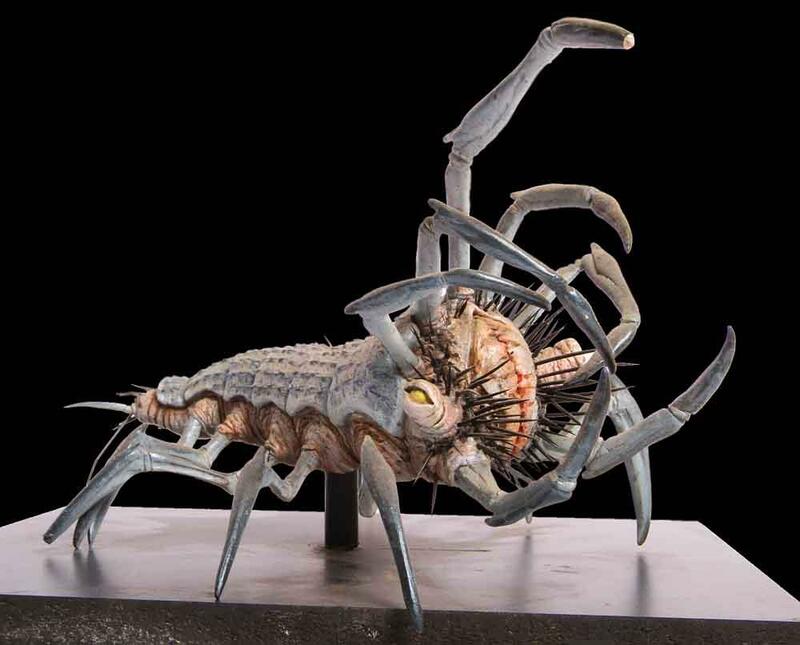 To ensure consistency, most creature designs — except the primates — were produced at Tippett Studio, with concept drawings, maquettes and reference materials passed over to PDI and KNB for their tasks. 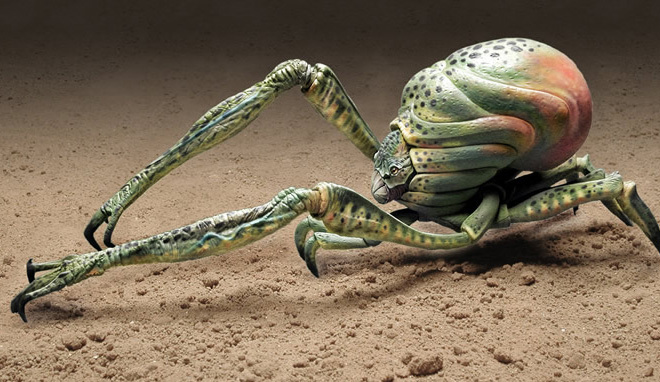 Reitman also reviewed the design process weekly and was the final decision-maker on every detail of the alien creatures, their ecology and their habitat. By the time all companies had been assigned their tasks, there were only weeks left to deliver certain shots — and in some cases design work had yet to be completed. St. John recalled: “it took a lot to get the design process up and working in the beginning. We wanted to have all 18 creatures designed and finaled before we started shooting. We did fairly well — we were only short by about four, and one of those was the amoeba-like organism.” This schedule resulted in a compressed design process. 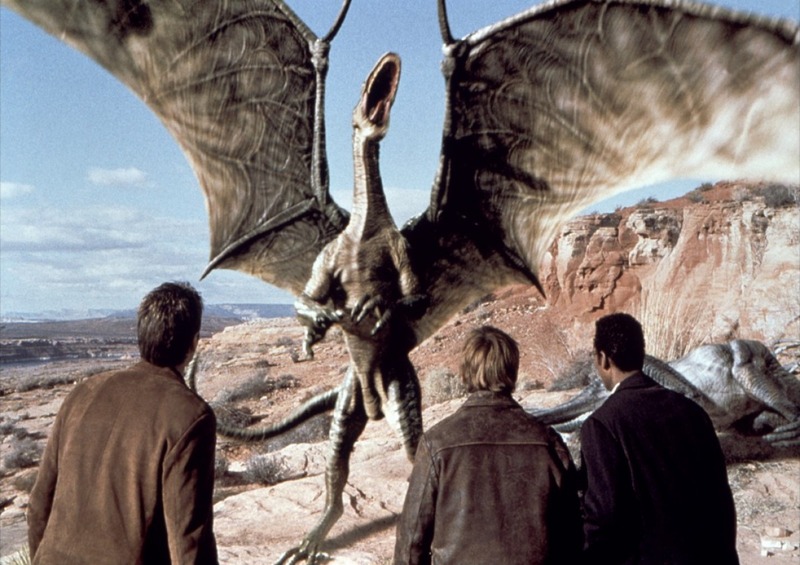 Creature iterations evolved even concurrently to the creation of animatics for major sequences; and as principal photography began, some shots were still in the conceptual phase, whereas others were being finished. 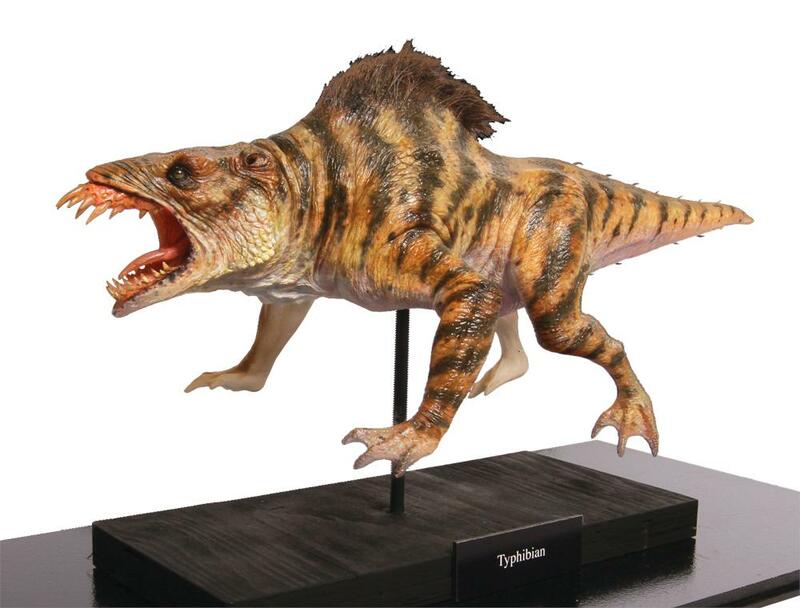 Every creature, once finalized, was sculpted into a maquette (principally by Peter Konig and Damon Bard) and cyberscanned; some maquettes — such as the Tiphibian — had to be broken down and scanned in parts. The resulting digital model was then refined manually. Colour scheme maps were hand-painted, whereas displacement maps provided texturing and detailing. A combination of key-frame animation and a flocking tool — recently developed by the company — was used for the flatworms. Individual worms were animated manually, then replicated into thousands of them with the flocking system, which assigned a random, organic motion to the numerous layers of digital worms. 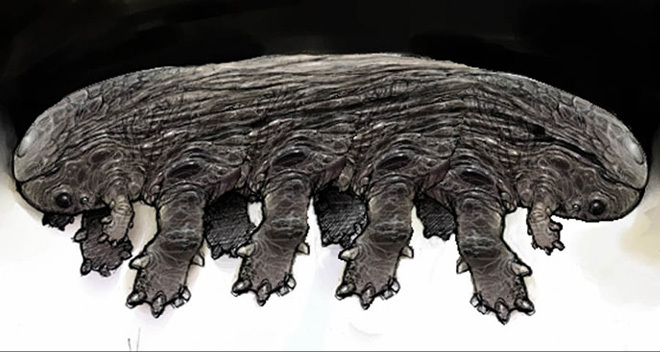 Imageworks also produced images of the flatworms reproducing, as Berney explained: “we actually got the innards of the flatworms to pull themselves apart and duplicate. They slowly divide as the membrane rips apart. It was a pretty tricky effect, particularly as we had to do it in a month.” Various practical dead flatworms were devised by KNB. Gray discovers a trail of flatworms, which leads him to a water tank with an aquatic creature within. 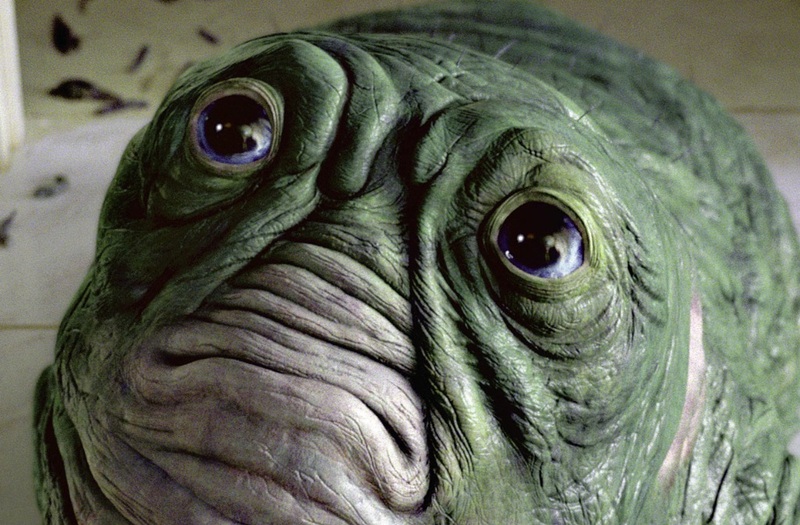 This ‘leech’ alien was designed by Tippett Studio and animated by PDI. The next spawn of the evolutionary cycle is instead an amphibious monster that emerges from the a golf course lake, snatching an unfortunate country club member. 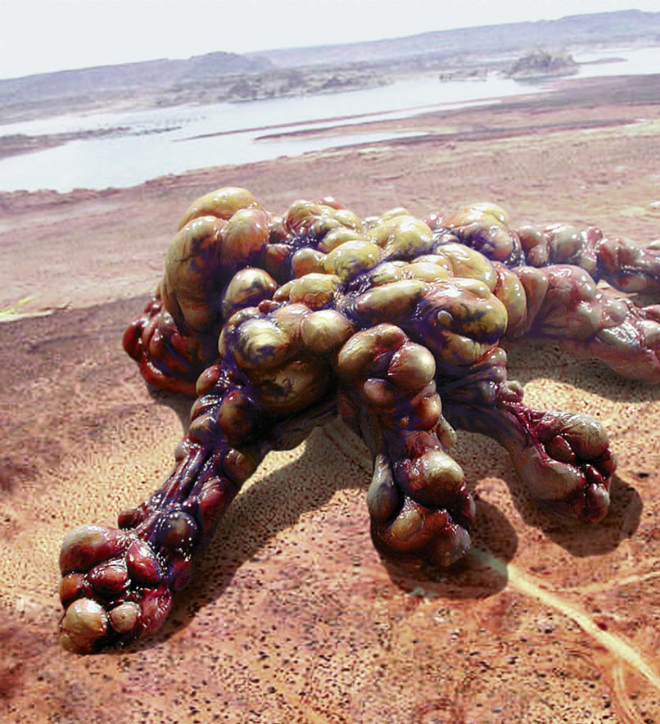 This creature, dubbed the ‘tiphibian’ by the crew, was designed by Peter Konig. The design combines reptilian and mammalian characteristics: its skull, fundamentally based on that of a horse, is endowed with protruding teeth. Exposed gums and goat-like eyes complete the look of the head, whereas a hairy hump lines its back. 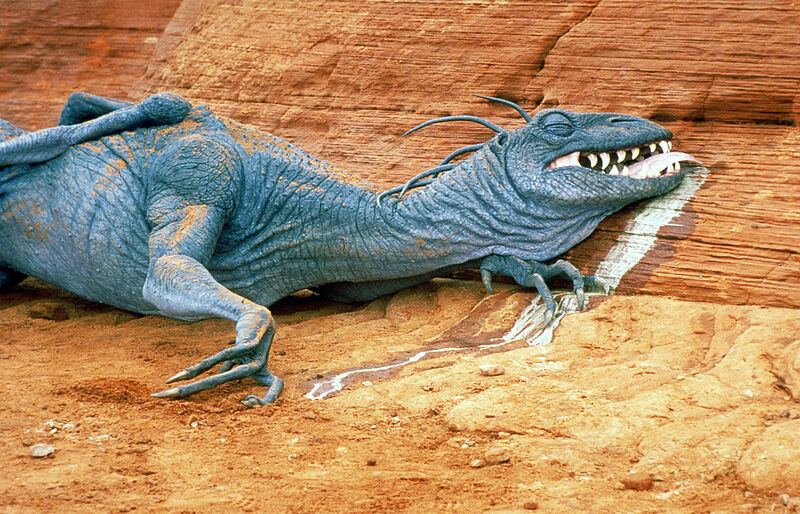 Its colour scheme was based on predatory cats. While the living tiphibian was portrayed with a digital model, the dead Tiphibian brought by Gray to the professors was a foam latex dummy provided by KNB. As the invasion spreads, a strange monster — dubbed the ‘cutie pie dog’ by the crew — is discovered in a household. 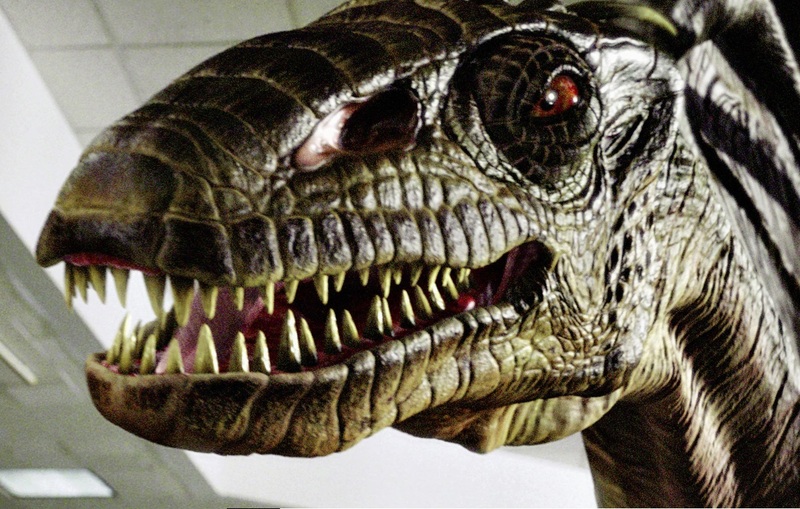 The mild-looking creature suddenly opens its mouth, revealing a second turkey-like head on the end of a muscular tongue. Reference for the facial movements of the cutie pie dog was taken from the film Milo and Otis. “It had some awesome stuff with the pug that gave us all the looks we needed for the cutie pie dog,” said animation supervisor Eric Reynolds, “the surprised look, the angry look, the sad look. At first we thought, ‘we can’t pull this off. All we have is this smashed face with big eyes.’ But it actually worked.” The crew devised a library of five main expressions; the animators could segue from one to the other using slider controls. Other animations included the body jiggling with the creature’s motion and the ‘wheezing’ action that occurs with its death. As with the tiphibian, a dead cutie pie dog dummy was created by KNB. 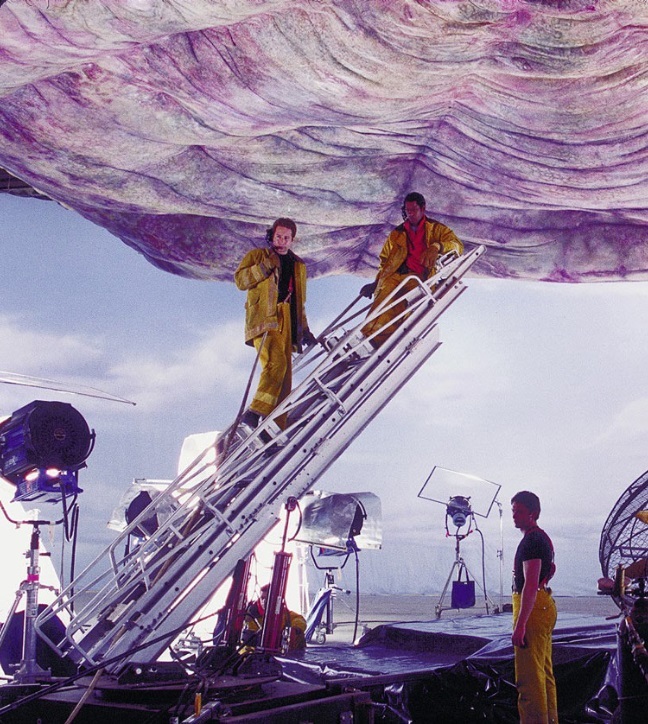 The set was digitally scanned to devise a double for digital creatures to move in. 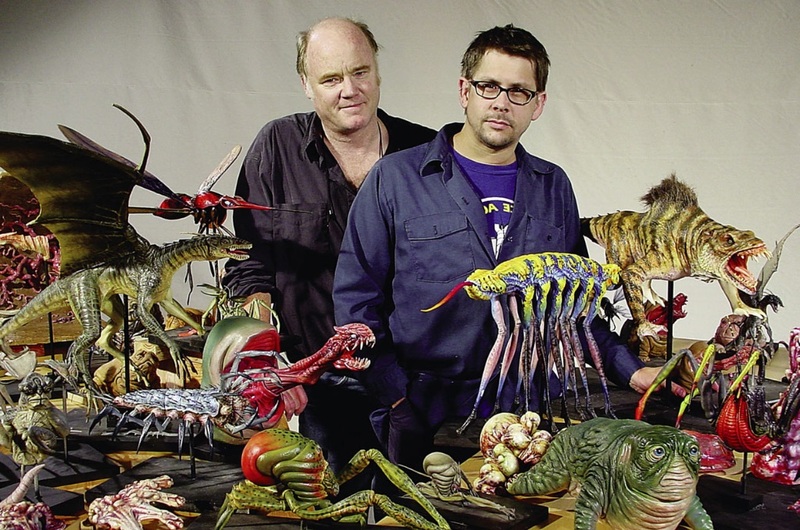 Visual effects co-supervisor Frank Petzold noted: “we were given enough digital information to create a highly detailed model within which the digitized creatures could move in an entirely convincing manner.” Lively fauna flew, crawled and slithered in the environment: Tippett Studio devised several digital arthropod-like aliens, including: the centipede-like ‘swarm crabs’; coconut crab-like creatures; a large predator dubbed ‘butthead’ for the shape of the back of its head; and a bizarre millipede-like creature with a head on each end of its body, which is quickly eaten by a carnivorous plant. 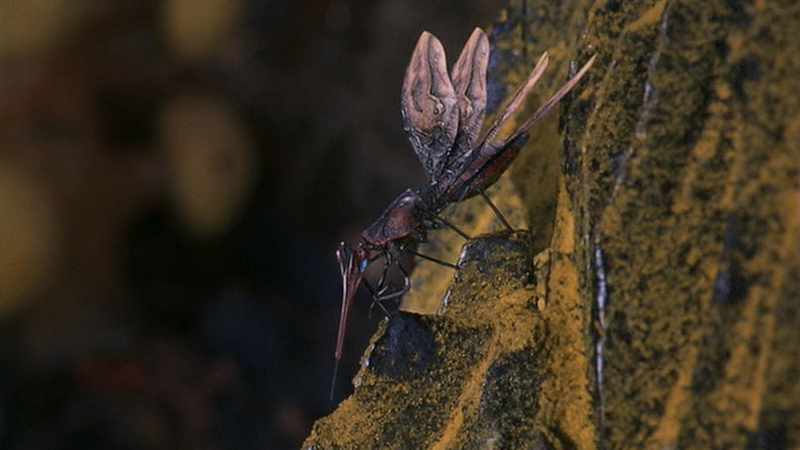 One of the creatures — a mosquito-like insectoid, dubbed the dragonfly — penetrates Harry’s body. The most challenging aspect of the character animation was the quick buzzing wings. 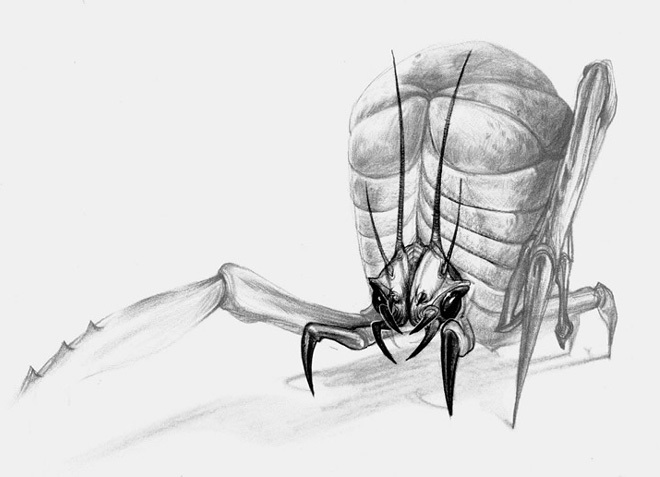 Brennan Doyle, part of the crew, related: “the wings had to move fast and there had to be motion blur, but you still had to detect the shape of the wing within that blur.” The mosquito shape moving around within Harry’s body was a PDI effect. 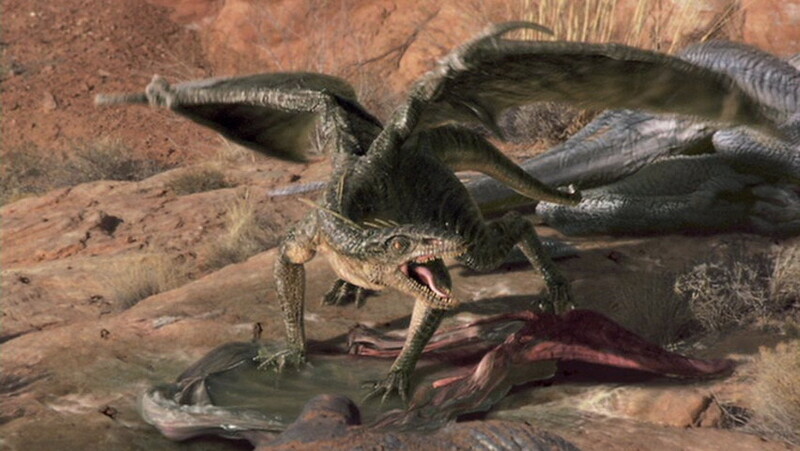 New, more advanced aliens are discovered afterwards: a valley houses a graveyard of dead or dying dragon-like creatures, a combination of digital animation and practical models. 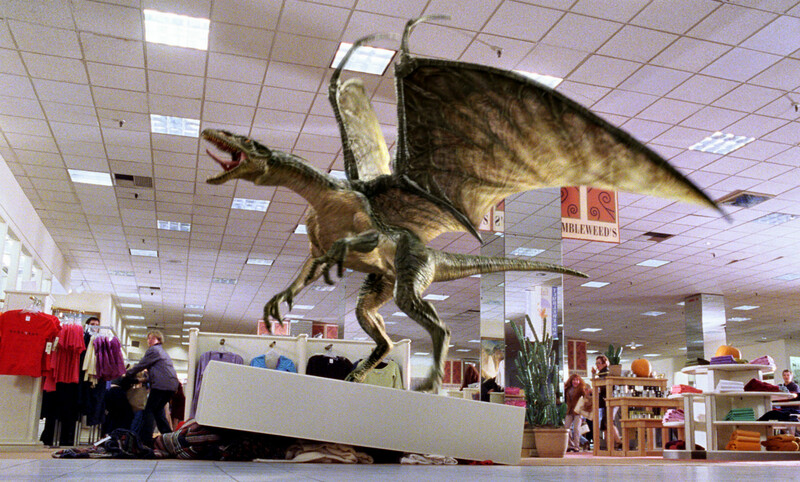 Design of these monsters — including the ‘wal-mart bird’ that wreaks havoc in a mall — began as more bird-like, as opposed to the final incarnation whose appearance is more reminescent of lizards and pterodactyls. Konig recalled: “it took many, many versions to come up with something that Ivan would go with. The sketch of the wal-mart bird that he finally picked after so many passes was one that we were actually about to throw in the garbage. 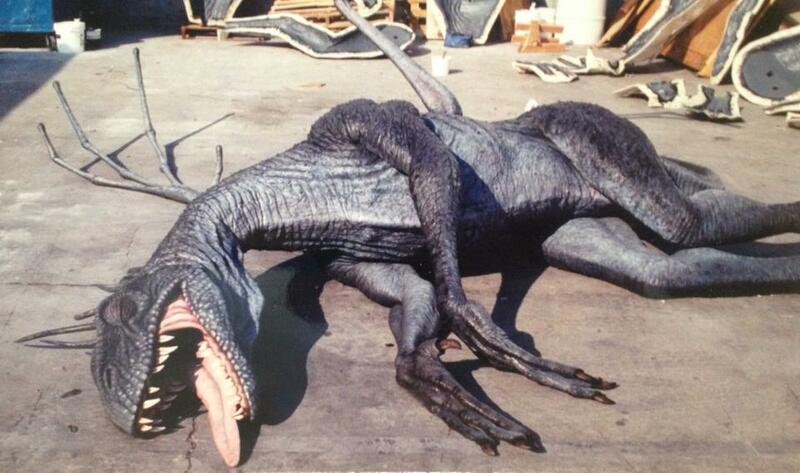 We learned to always bring all the stuff we had — even the stuff we didn’t particularly like.” The final design was delivered late into production, when certain scenes involving the creatures had already been shot. 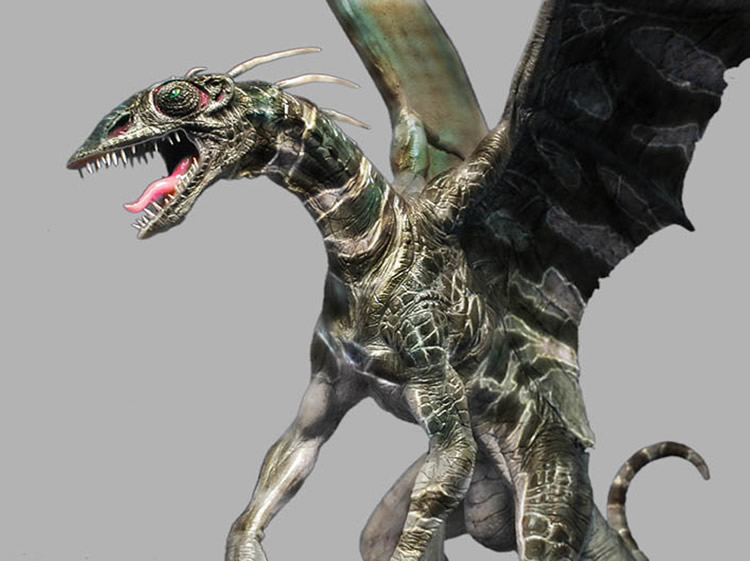 In fact, a scheduling conflict created the particular situation where the practical monsters had to be completed before their digital counterparts were even modelled. The inevitable consequence was the rise of design issues of size and colour schemes. Nicotero recalled: “the size kept changing. One day they were 18 feet; the next day they were 22 feet. Also, the Tippett guys gave us the colour scheme Ivan had signed off on, and told us we had to match that; but we were building eight of these ‘birds’, and we didn’t know whether there should be some variety or if they should all look exactly like the approved colour scheme. 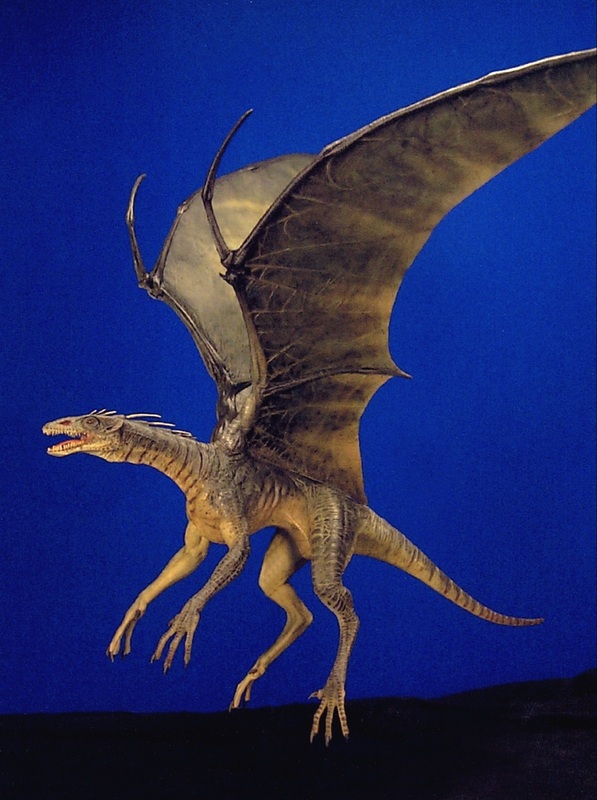 We had to be in agreement about such design issues, because Tippett Studio was going to be replicating hundreds of these things in CGI.” Once colour and size were nailed down, KNB crafted eight full-size dead ‘bird’ puppets, with flexible armatures inside so that they could be put in different death poses. Reitman supervised the design process. ADI co-founder Tom Woodruff related: “we started with sketches, and met with Ivan to narrow those designs down to the ones he liked. Then we started building maquettes. 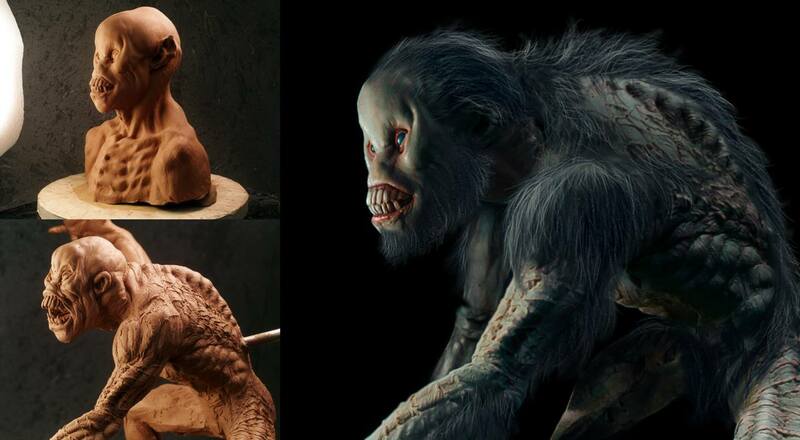 Once we had maquettes done, Ivan chose a body and a head that he liked; and, in Photoshop, we combined them and completed the image of the creature.” Ryan Peterson designed the face, while Jim Kagel did body designs; Steve Koch spliced the separate elements together digitally. Three ‘secondary’ suits with more limited functions were devised. Instead of silicone, they had a lighter-weight foam latex skin. The remaining three were ‘third-tier’ suits and were essentially background suits, without animatronics. The third-tier suits were originally supposed to be seen in silhouettes or long shots, but Reitman was impressed with them to the point of using them in certain foreground shots. 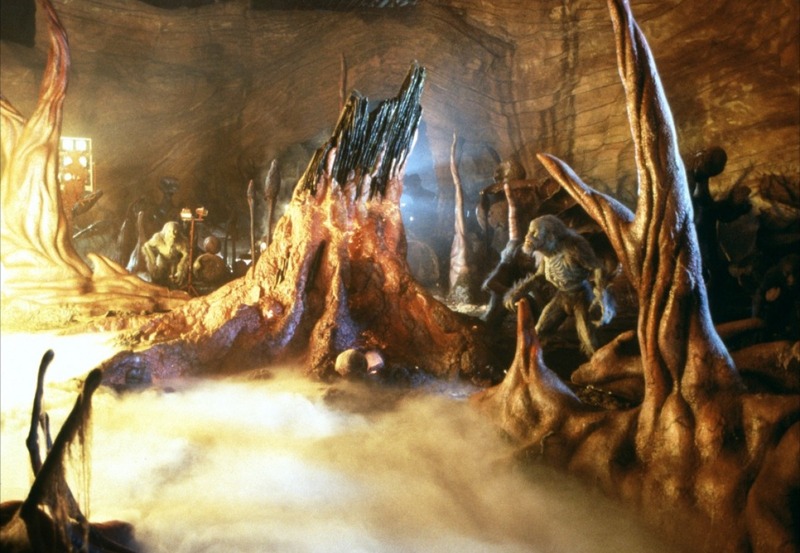 Kane and team discover that heat accelerates the growth rate of the aliens exponentially — something shown when a match hits a petri dish, unleashing the growth of a primitive organism (an entirely digital creation inspired by fungal growth). This is also proved true when napalm bombing causes the entire alien habitat to be assimilated by a growing amoeba-like organism that reaches vast proportions. Tippett continues: “we had to imagine it dynamically — actually see it moving; and the more we did that, the more we realized that an amoeba is an abstraction. 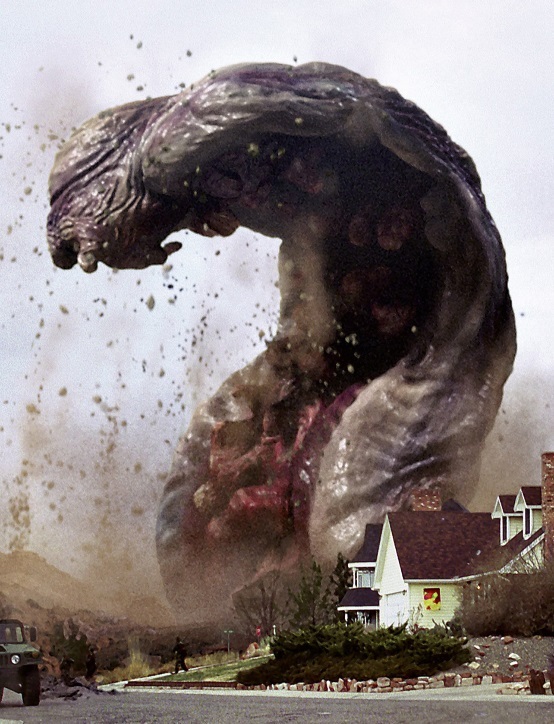 It’s not a creature like Godzilla or King Kong, it’s much more like a giant tidal wave or a twister. It’s a force of nature.” A tentacled maquette designed by Hayes and sculpted by Bard and Konig was scanned to provide the basic digital model. 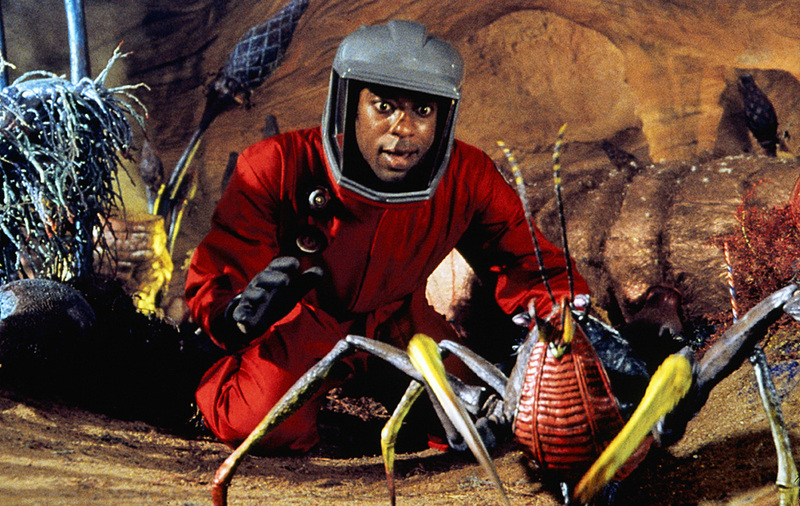 Although the creature was mainly a digital effect, Tippett suggested to build a practical section that could be seen in close-up, interacting directly with the actors for the scene where dr. Block inserts a fire hose into a remarkably sphincter-like opening and injects the amoeba with selenium. KNB devised the full-size practical section based on a Tippett rendering. The section was cable-operated and required 12 puppeteers to maneuver. “The whole thing would flex and pulse like a living thing,” Nicotero said. For more pictures of the ever-evolving aliens, visit the Monster Gallery. Posted on 23/11/2017, in Movie Monsters and tagged Amalgamated Dynamics, Evolution, KNB Efx, Phil Tippett. Bookmark the permalink. 1 Comment. I have always liked this film. 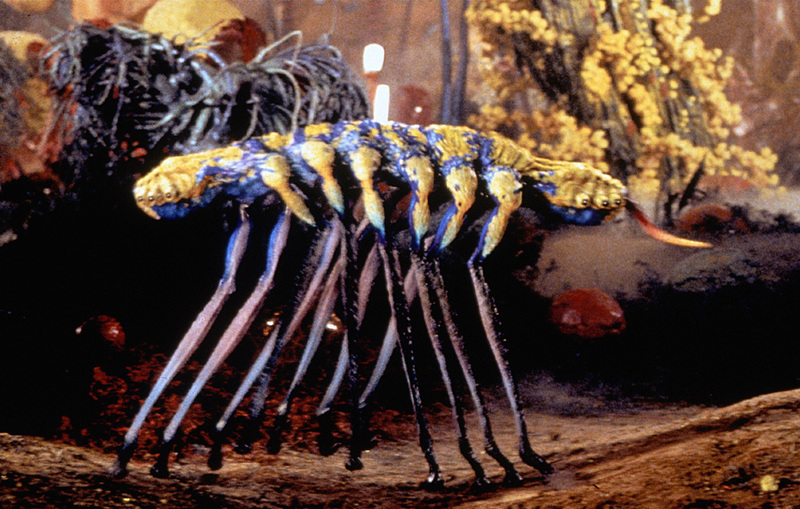 My favorite alien has to be the dragonfly creature. I love how realistic it looked when it went to Harry’s hazmat suit or when it crawled under the skin. Even when the doctor finally pulled it out looked realistic like it had actually been inside Harry’s body.